Sony Xperia Z3 review | What Hi-Fi? If it feels like only a few months since Sony launched its last flagship smartphone, that's because it is. 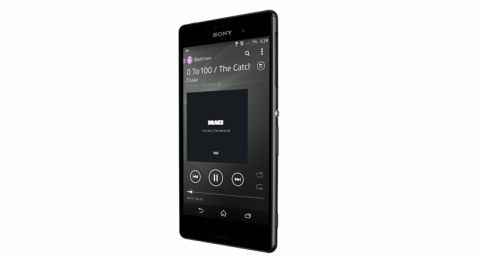 The Xperia Z2 is only a mere six months old, and yet it's already out on its ear to make way for the new Xperia Z3 phone. While it might seem that Sony is making a habit of fast flagship turnarounds, the good news is that the Z3 is superb. Taking everything we loved from the Z2 and making it better, while refining the bits we didn’t like so much in the process. The Xperia Z3 is the Sony smartphone we’ve been waiting for. At first glance, the Xperia Z3 might look a lot like its predecessor, but take a closer look and there have been plenty of subtle tweaks that make this the best-looking phone Sony has ever made. While it still continues the OmniBalance design language that we've seen in the Xperia Z ranges before it, the edges are now rounder, which makes the Z3 much easier to hold. The sides are now the same colour as the rest of the phone too (it’s available in black, white, copper or silver green), replacing the silver metallic trim of the Z2. This gives it an overall softer, more premium look, which we think looks very nice indeed – even the buttons and ports have been given a softer finish than the angular designs on the Xperia Z2, which makes for a more refined overall look. Following the international rules of smartphone launches, the Xperia Z3 is both thinner (down from 8.2mm to 7.3mm) and lighter (by 11g) than the Z2, which further helps with its ergonomics; it’s actually slightly smaller in its overall size as well. In your hand, the differences are noticeable, and take the Z3 from the level of good to great, with a design that finally feels as good as the experience. It can’t quite take the crown from the likes of the iPhone 6 just yet, but it’s a big improvement from a design that may have put some off before. As we've come to expect from Sony handsets, the Xperia Z3 is both dustproof and waterproof (to a certain degree), offering the highest level of protection available in a smartphone. The durability theme continues with the new colour-coded nylon tips on the corners of the handset, which should help to prevent any damage if dropped – a nice consideration for a phone with glass panels on the front and back. It is worth noting that our review sample picked up a few noticeable scratches to its back panel during testing – we’d certainly advise investing in a case if an immaculate handset is important to you. Sony has chosen the same screen size for the Z3, at 5.2in, and has decided to stick with a full HD screen in place of a 2560 x 1440 pixel one, like that on the LG G3. The reasoning? It’s too hard for the human eye to tell a difference, and the sacrifice that it’d make in battery life as a result is not the right trade off to make. So says Sony. We’re not upset about that – we loved the Z2 screen and the Z3 is even better, holding its own against the impressive crop of 2014’s big hitters. Plus, the battery life is impressive, but more on that later. As before, Sony has piled the display tech from its TVs into the Z3 screen, including things like Triluminos with Live Colour LED and X-Reality. Sony says this should produce sharp, realistic images with a wide colour palette and better contrast. Colours are certainly punchy on the Z3, sitting between the cooler, neutral tones of the iPhone 6, 6 Plus and LG G3, and the warmer colours of the Moto X and Samsung Galaxy Note 4. This vibrancy is never pushed into looking overdone or unnatural though, sitting firmly on the right side of warm and exciting. While Sony seems keen to push its 'X-Reality' feature, we’d definitely keep it off, for video at least. It over emphasises sharpness and boosts colour saturation unnecessarily, causing the odd motion stutter in the process. Detail levels are good and contrast is strong, though whites do tend to have a rather bluey tinge to them. Luckily Sony offers manual white balance tweaking, so it is fixable if you find it to be something that bothers you. Blacks are inky and deep though, and offer plenty of shadow detail – AMOLED screens like that on the Galaxy S5 might be able to go a touch darker, but we’d take the overall balance of the Z3 any day. A new addition for this screen is the capability to go 20 per cent brighter than the Z2, making it better for using in direct sunlight. This is bolstered by the 'Dynamic Contrast Enhancement', which can react to the light in your surroundings and adjust your screen accordingly. We’re happy to see Sony has listened to feedback – the brightness on the Z2 was a niggle of ours, and makes the rather reflective Z3 a much better device to use outside. We really enjoyed the standard audio performance on the Z2, so the addition of high-res audio to the Z3 makes us even more excited to try it out here. High-res tracks are marked with an 'HR' logo so you know which is which, though just take a listen and you’ll be able to tell. It’s a much better high-res performance than that of the LG G3: exciting and engaging, with plenty of punch and attack. We listen to a high-res master of Michael Jackson and Justin Timberlake’s Love Never Felt So Good, and there’s a wonderful sense of space with a tight, warm bassline, and a precise, detailed character. Switch it up to Muse’s Supremacy, and the Z3 shows its rhythmic prowess, with superb dynamics that rise and fall with the song’s peaks and valleys. There’s plenty of bite to the aggressive guitar opening, with vocals focused and full of expression. For those yet to join the high-res music revolution, you’ll be glad to hear that the standard-resolution performance offers a similar character, with an expected drop in subtle detail and a smaller sense of space. But it’s still a lively performance: precise and immersive – we wouldn’t mind a few more notches of volume though, as it can sound a little quiet when compared to other handsets. It’s also a slightly leaner character than the iPhone 6 or Moto X, the former still tops our pick of audio in a smartphone, but it comes close when it comes to detail levels and dynamic punch. While the megapixels of the camera have stayed the same at 20.7MP, Sony has made some improvements elsewhere to help make its snapping performance even better – and let’s not forget, this was a good camera to start with. These include a wider 25mm G lens, which gets more of your picture into shot than before, while the improved 'SteadyShot' image stabilisation gets the addition of 'Intelligent Active Mode' for serious post-edit motion smoothing – perfect for sports fans. It’s also boosted the ISO sensitivity to 12,800 – the first for a smartphone and something that aims to improve low light shots, with less noise too. We took this to the extreme, by taking a photo with the Z3 in a pitch-black box. It was able to make out the object inside, while the iPhone’s effort came back pitch-black, in contrast. In real use, its new capabilities are less obvious, but considering the Z2 was a good performer in low light anyway, the Z3 manages to do a touch better, with a little less noise. In regular light, the Z3 offers beautifully balanced, seriously detailed shots. The 'Superior Auto' mode is still a little hit-and-miss. For a start, you can’t make use of the full 20.7MP – you’re limited to 8MP – and it doesn’t get the right shot every time, sometimes struggling with exposure and white balance. You’re much better off sticking with the manual mode and having a play with some of the settings. It can be quite an overwhelming camera app when compared to some of its more point-and-shoot rivals, but spend a bit of time with it and it will reward you with superb shots. To top this all off, Sony has added six new applications to its camera app’s capabilities, such as live filming to YouTube and the 'Face In' dual shot mode, which adds your face into the main shot. There’s also the 'Multi-Camera', which lets you combine images from up to three smartphones for a multi-angle shot. We’re happy to see 4K filming return from the Z2, albeit with some new recommendations to film in smaller bursts to help prevent overheating. Sony has made some bold claims about the Z3’s battery life, stating it should be able to go for two full days under regular use before needing charging, up from a claimed 1.4 days for the Z2. With a slightly smaller battery compared to its predecessor (3100mAh), we were more than a little sceptical about this, but we’re happy to report that the battery life on the Z3 is the best we’ve seen in any recent smartphone. Taking it out on a testing spree with likes of the LG G3 and HTC One (M8), it outlasted them both and then some, averaging around a day-and-a-half of medium-to-heavy use before it needed charging. If you are ever caught short though, Sony has included the effective 'Stamina' mode that we liked on the Z2, alongside a new 'Ultra Stamina' mode that strips the phone’s functionality right back, leaving you with the basics for when you really need to conserve juice – perfect for festivals and the like. Our friends over at Stuff.tv conducted a battery rundown test, with a 720p looped video, the screen on half brightness and with wi-fi on. The Xperia Z3 managed 13 hours 53 minutes; in contrast, the LG G3 managed 9 hours 25 minutes in the same test. Previously the PS4 gaming on your Sony smartphone has only stretched to a second screen experience, but with the Z3, that’s about to change. The 'Z3 Remote Play' feature will enable you to play your PS4 game directly on your smartphone, preferably streamed over the same home wi-fi network for the most stable connection. The GCM10 gaming mount will allow you to attach your Z3 to your DualShock controller for the best experience. This functionality is expected soon after the phone's launch (around November) and as such, we’ve yet to test it out. We’ll update this review with our thoughts as soon as we get our hands on it. Getting down to pure spec-sheet facts, the Xperia Z3 packs a faster 2.5GHz quad-core Qualcomm Snapdragon 801 processor, which sits alongside 3GB RAM and 16GB of internal storage. The microSD card slot will allow for expansion here, up to a maximum of 128GB, which should provide plenty of room for your movies and high-res music files. Android 4.4.4 Kit Kat is at play here and looks great with Sony’s skin over the top of it. It’s slightly heavier handed in its look – we prefer the purer experience offered by the Moto X – but it’s an attractive design that is easy to navigate and doesn’t hinder use. There’s still plenty of Sony bloatware included, but you can delete it, which makes things much more simple. However, the likes of Sony’s 'Music and Movies Unlimited' services are now present in Sony’s own music and video applications, with suggested content offered up below your own. You can switch off 'Music Unlimited' from showing altogether in the settings, but you don’t have the same privilege for 'Movies' – though it’s worth noting the content will only show if you’re signed into a Sony Entertainment account. Performance-wise, it’s a joy to use and runs without a stutter. We multi-tasked this handset to the point that we can hardly keep up, and it showed no sign of any instability. We’d just make sure that all of your apps are updated as soon as you get it out of the box to avoid any unnecessary crashes. The Sony Z3 is every bit the flagship handset that Sony wants it to be, looking the part with its improved design, and offering just enough innovation and new additions across the board so that the Z2’s short lifespan hasn’t been in vain (the Z3 was priced at £530 sim-free at time of testing). There are next to no compromises here, and very little in the way of gimmicks, which is refreshing. Instead, everything that’s been squeezed into this handset has been well considered and well realised, with Sony’s expertise when it comes to camera, screen, gaming and audio technology shining through to make this smartphone a true multimedia powerhouse.